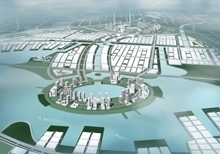 The Zhengdong New City of 1.5 million people was designed with the aim of creating a new-loop city, a “Ring City” for the CBD of the Zhengdong district (5040ha). 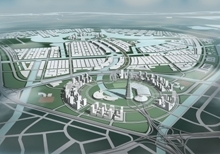 While placing an emphasis on the existing link between the Zhengzhou city district, we designed a multilevel ring road to solve the traffic congestion in center. The design of the ring road was based on the themes of metabolism and symbiosis of metabolism movement of 1960. Ring city is a cell cluster without center, in other words, it is a city of no center, and was designed to blend in with the ring high-rise-building zone. The center is void (park) andclearly categorized in five areas depending on their function and form a municipal park, an educational forest, a riverside park, traffic playground and a central park (Lakeside). We have effectively planted over 200 varieties of plants that inhabit Henan Province while also preserving the view of the high-rise buildings and surrounding city aiming for a city that is symbiotic with the nature. 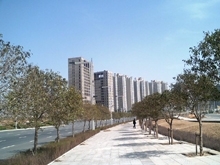 Zhengzhou Model Housing demonstrates the concept of a secure and private living environment with distinct public and private realms, resembling the spatial concept of the traditional Chinese habitats. The representative lifestyle model of the traditional Chinese courtyard is reinterpreted within the current context. Inner courtyards are enveloped between blocks as communal space for the residents. The separate zones of the residential, retail and communal facilities overlap in space and are consistent in their architectural form. The Club house is the centre of the public realm, with open plazas and facilities catered for communal use. Vehicular traffic on the ground level is restricted only to the periphery and along the central spine to ensure maximum pedestrian circulation within the development. Private gardens and roof gardens are strategically located at different levels to serve as crucial psychological relief as well as creating a lush hanging garden effect. As a result, staggering building of 2 to 5 storeys high create an interesting　building skyline. Architectural features assist in breaking away from uniformity, like the articulated building tilt from the predominant linear blocks and the inclusion of strategic pitched roofs amidst the flat roofs. Another distinct feature is the balconies. Glass panels clad and link balconies, forming an overall 4-storey high ‘glass-box’ effect. In contrast to the ‘glass boxes’, a series of ‘concrete box frame’ articulation acts as a counter balance and adds another layer to the architecture articulation. Other features of this housing development include a treatment of the basement level as a part of the 1st storey duplex unit. The basement level has a double-volume void at the staircase area and allows interaction between the two levels. One other special duplex unit type is detached from the main building block on the 4th storey, and from the lift lobby the owners of these units walk through their private open roof garden before reaching the main entrance door, an experience similar to ground level units with a front garden. 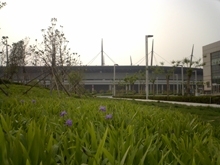 Zhengzhou Convention center will be located in the Central Park of the Zhengdong New Town. The Convention center will consist of two facilities such as a Conference Hall for 3000 seats and a two-leveled Exhibition Hall. 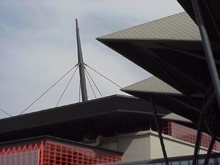 The Convention center was designed considering the natural landscape of the Central Park, and its design is applying a unique for China roof structure suspended on masts standing together that may be seen in the distance. This feature gives an impression of a dramatic design. Furthermore, the location is chosen so that the building encircles the Central pond, and a Shopping Mall is designed along the pond side providing beautiful scenery views. As such, even when no conference events are held, this area is still very attractive for tourists. The Convention Hall will be a combination facility of Main Halls, also in the future a Convention Hotel and Art Center are planned to be connected by the Bridge that will provide a better accumulation effectiveness of the facility and improve the usage features. The facade on the pond side will have a light glazed finishing, so that visitors may enjoy beautiful pond scenery from the Promenade area of the Convention Center. The facade on the Ring Road side is designed in the contemporary style applying paint coating on aluminum plates. For cost saving the roof finishing is a paint coating on stainless steel. Deep eaves of the roof create an oriental atmosphere of the architecture.